The early signs of oral cancer are often easy to overlook. Unfortunately, if you don't receive prompt treatment for cancer, it may spread. Dentists Dr. Nicholas Papapetros, Dr. Jhon Giraldo, and Dr. Leo Kharin of Dentistry by Design in Andover, MA, share a few common early signs of oral cancer. Does it seem as if you've had a canker sore or cut in your mouth forever? If you've had a sore for more than a few weeks, it's a good idea to pay a visit to our Andover office. Although slow healing can be a sign of cancer, your sores may also take longer to heal if you have diabetes or a condition or disease that affects your immune system. Lumps and bumps anywhere in your mouth, including your gums, tongue, throat, neck or the lining of your cheeks, are a cause for concern. Oral cancer may sometimes cause red or white patches to form in your mouth, throat or lips. Pain can be a symptom of oral cancer even if you don't notice any visible signs in your mouth. Although pain doesn't always mean that you have cancer, it's an indication that something isn't quite right. Depending on where the cancer is located, you may have trouble chewing if you have oral cancer. The cancer can make it hard to move your jaw or may cause numbness. Cancer may make swallowing difficult or might cause hoarseness. Some people who have oral cancer feel as if they have a sore throat that never goes away or a constant lump in the throat. Loose teeth are never normal in adults and should always be investigated. 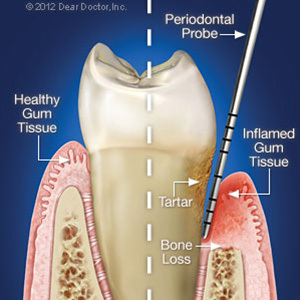 Both oral cancer and gum disease can cause loose teeth or dentures. Oral cancer screenings are part of every dental checkup. If you see the dentist every six months, it's more likely that oral cancer will be caught in its earliest, most treatable stages. Protect your health with regular dental visits. Call dentists Drs. Papapetros, Giraldo and Kharin of Dentistry by Design in Andover, MA, at (978) 475-5333 to schedule your appointment.